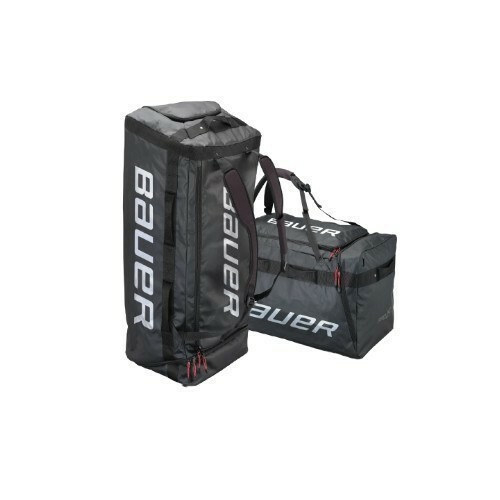 The Bauer Pro 15 Carry bags feature tons of storage space inside a main compartment with an easy access U-shape opening. The bags also offer a separate skate pocket to keep your jets from causing any damage and a fleece lined helmet pocket to protect your visor and bucket inside your bag. The bag is made up of a pro tarp material to provide waterproof durability throughout its lifespan and also features dryflow ventilation grommets and metal zippers to further increase the last. To finish, the Pro 15 bags feature anatomical padded shoulder straps for easier carrying with a Velcro closure if you wished to carry the bag over your shoulder.